That’s the premise of Unepic, a, sprawling, indie-designed platformer-RPG with a cheesy, tongue-in-cheek approach to games and pop culture. Think of a combination of “Metroidvania” and Diablo styles, with a few dashes of Bill & Ted’s Excellent Adventure for flavour. Whether all its influences are to a player’s taste may depend, but it’s hard to deny that there’s a very solid game here. 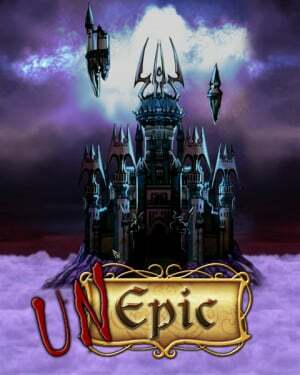 The malevolently medieval castle that serves as Unepic’s main setting should feel familiar in structure to anyone who has played a title like Castlevania: Dawn of Sorrow. One is free to wander and discover the rooms that are currently open, but bosses must be vanquished and keys found to open up new areas with new objectives and sidequests. The castle, from a level design perspective, is very well thought out. There are plenty of nooks and crannies for secrets, traps spring up now and then but aren’t constant enough to be a nuisance, and a convenient network of gates and teleportation spells make travel easy. Each room also contains a number of torches and lamps that can be lit by main character Dan’s always-available lighter. This not only makes it easier to see, but can also mark out what parts of a room have been reached and what still may need to be accessed. It is a clever and seamlessly integrated system that makes exploring feel more exciting and less like an unnavigable chore. Unepic’s selections of weapons, magic, and equipment also open much up to the player — seven different classes of weapons can be found, with multiple types in each. Every weapon type has certain natural advantages and disadvantages: maces are more effective against armoured foes, for example, while daggers cause more damage if you sneak-stab the enemy from behind. Magic and equipment have similar give-and-take features, from spells and potions to armour and robes. With all this variety, however, come choices. When levelling up, a limited number of points are granted for categories representing each of the weapon, magic, and equipment types. Points raise proficiency in each category and allow access to higher-level equipment. So is it better to be a jack-of-all-trades at the cost of not getting the bigger guns, or to master a few things and have to push through when something nasty shows up that isn’t weak to them? The respect Unepic gives players in making and living with their decisions could be seen as a boon or a curse, depending on your own perspective. There is almost no hand-holding here, and while things start off simply enough, the challenge slides up at a steady pace even among the lower of the four difficulty settings. Even so, while a new section may seem outright punishing at first, a bit of time to re-equip or plan a new strategy can make a world of difference. Luckily, Unepic is set up on the Wii U to make switching between items as easy as drinking a Potion of Item-Switching. When playing on the TV, the GamePad serves as an easy go-to board for accessing whatever you need; and when in off-TV play, up to 12 items can still be assigned for instant access through button combinations. In fact, off-TV may be the preferred method for some to play, as it allows zooming in on the character instead of a constant full view of the room. Unepic’s graphics are on the simple side, but that melds well for the more “old-school” theme and presentation; the music is similarly low-key but atmospheric. That leaves the potentially divisive writing and dialogue. The jokes can be very hit-or-miss, with a heavy leaning on nerdy culture and references for the sake of references. Some may love it; some may despise it. Still, there are better, more original segments featuring Dan and a companion who does not always have his best interests in mind. Everything is voiced, most of it not too terribly, and most of this stuff can be easily skipped if desired, anyway. With much to explore and so many ways of storming the castle’s inhabitants, Unepic is a fun and well-designed challenge for those who enjoy platformers and yon hefty olde RPG feel. Its tight and rewarding core makes it a quest that can be enjoyed along with, or even in spite of, its cheekier sense of humour. Was waiting for the review, may have to pick this up, looks interesting. This is the first review I've even seen on this. Its about right where I was expecting it to score. Ill put it on my wish list for sure. Too many games so little time! Looks like I'm getting this game after all! Nice job Tim! Might be worth a pick up once I catch up on my Wii U backlog. But guys, that was one of the first subhead puns. I wasn't sure if "Not ungood" implied bad or good. Double negatives are a no-no! "In fact, off-TV may be the preferred method for some to play, as it allows zooming in on the character instead of a constant full view of the room." I might pick this up. I don't usually buy Eshop-exclusive titles for my Wii U. The only exceptions are NES Remix and possibly Gamecube Virtual Console (or Dreamcast) titles once they are released, because I prefer all other Virtual Console titles on my 3DS. This is a great game and very good use of the game pad IMO. The ability to have everything layed out on the game pad is a clean way to view the inventory in a digestable format. 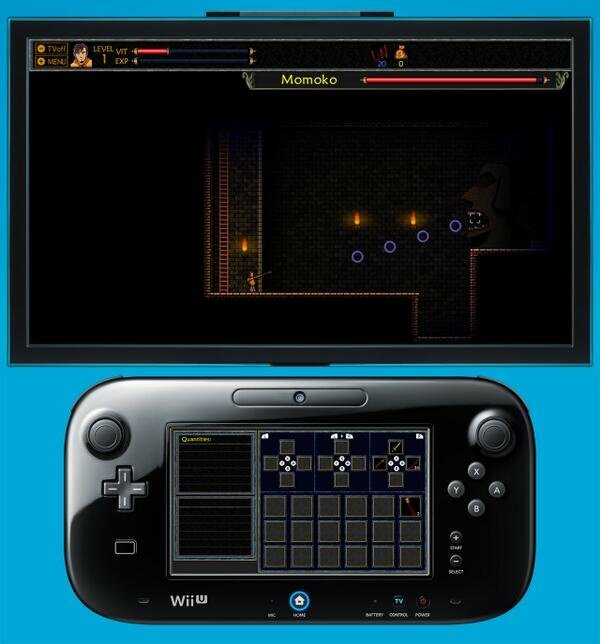 This a good example on how the game pad can be used for future games on the Wii U. The screenshots used in the review look like they are from the PC version. This is seriously one of the best eshop downloads I've played. It's exactly what Wii U needs right now. @hlime You are right about the screenshots. It looks like we were given the wrong shots to work with, unfortunately, and will be trying to get shots that better represent the Wii U version. Great review. I was getting this game anyway but this is the first time in a while that a critical analysis has actually made me more excited for a game! For those of you on the fence, this is a great game. Sort of a mixture of Earthbound and the Cave with some action thrown in there. I was waiting for someone to say this. Might have to pick it up. Sounds like a terrific game. Definitely interested in getting this now. Great review! Bought this last night actually and love it. 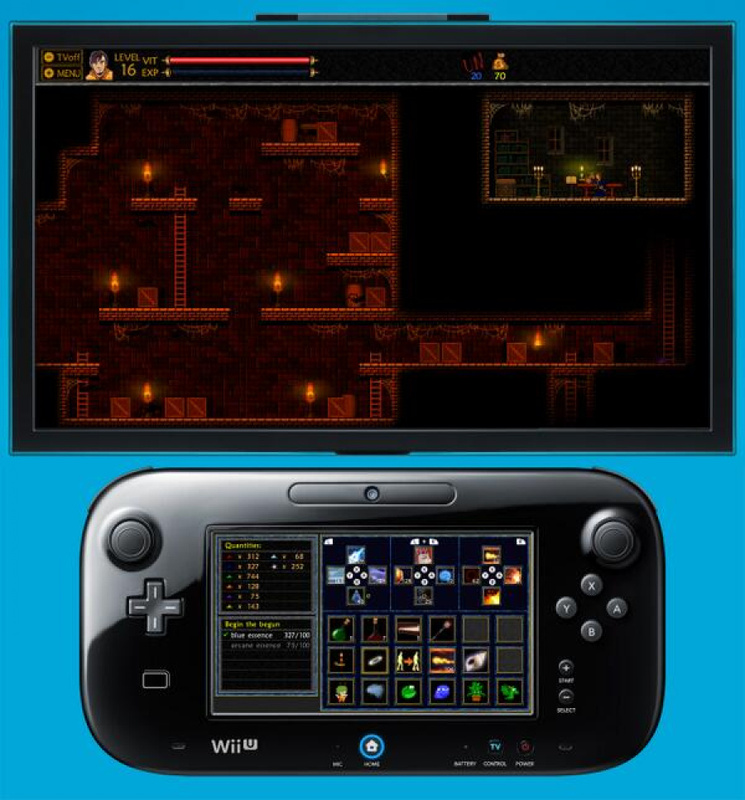 It plays very well, both on my TV and gamepad. A truly fun, new experience! i was interested, now i'm certain this is a game for me. i'm very big on table top games. Really good game. I'm still early on in it but it is very promising. If you're an rpg fan, I can't recommend this game enough. if you like "Metroidvania" games Unepic is a must! @crimzen_reign I had the same problem but you can switch it in the system setting on the wii I menu. Then it's perfect! Thinking I might pick this one up to finally clear the dust off of my Wii U. This sounds a lot like the book series"Guardians of the Flame"
Misleading title, this game is indeed Epic. This game is worth every penny. I do find playing on the gamepad much easier. How much content does the game have? I know the numbers, but I mean how long does it motivate you to play / replay it? Hmm...I had this one on my radar, I think I'll get it and pay for half of it with my DDP credit. Man, I'm impressed. Will be getting this! I'm glad Wii U is turning into a nice indie-box, I wasn't convinced by the first round of titles but every month they're getting better. Pretty soon Nintendo will have to watch out! 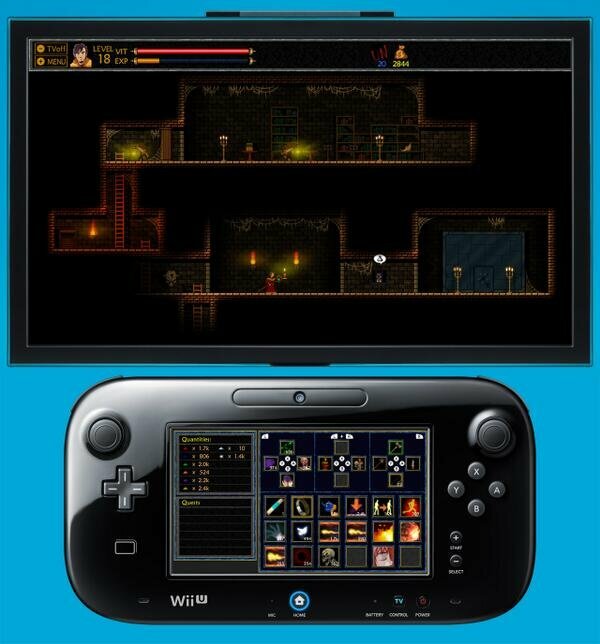 We really need to support these games and not let the eshop become Wiiware part deux! Normally I hold off for the review but took the plunge on this one last night... and I love it. Totally worth the investment as it is fun, addictive, and crafted with love and appreciation for the RPGs of the 1980s. I have 40 euros of eShop funds to spend but the only thing I'm remotely interested in is this game. I am normally not one for complaining, but boy its looking barren. I hope January's Nintendo Direct is coming this week. Hopefully with an immediate release of some awesome downloadable title. Good to see it's a good game. I might get it one day in the future. I figured it would be good. I'm just not interested anyway. It's good to see indie games like this. @SanderEvers This is why I'm leaning towards the concept that even with the Wii U not having many AAA 3rd-party developers, the indie groups fill in the gap enough that it makes the Wii U worthwhile. Nintendo + Indie = Nintindie! Thanks to "Symphony Of The Night", there's no such thing as bad voice acting (at least for RPGs). Sounds like my kind of game. Will definitely get it later tonight. Good to have Indies on Wii U like this. It shows promise. Funny how no matter how you look at it, Indie will always end with die, and Wii U will always be called dead. A perfect match. Might have to pick this up. Anyone know when Retro City Rampage is supposed to come out on the 3DS eShop? Thanks for the review NL! Will pick this up! It seems the delay paid off. We now got a much more polished game with great off-tv features. Good decision, EnjoyUp! Can't wait to pick it up when it comes to Europe this week. Can you play it without the Gamepad? No sale if not. @Mahe very good question, I would expect you can as its a multi platform release but no idea yet! Any to confirm? Good review and more about the features like the gamepad are welcome! It's a fantastic game! This should be one of those staple e-shop indie games that you SHOULD BUY!!!! DO IT NOW!!! Very solid, throwback-style fun. Really brings me back to questing as a kid. Love the '80s vibe. Thing is, I don't think I could play this without the GamePad. Off-screen with the ability to zoom transform, even saves, the experience. I appreciate the option to zoom out, but why anyone would want to play that way is beyond me. This is the kind of game made for off-screen, playing while watching Star Trek, or something. The story is unnecessary and voice-acting unappealing (I really wish we could turn off the VA and scroll through the text ourselves). The music is fine, but unassuming. This is all facilitates the off-screen experience very well. Without the GamePad, I wouldn't find it half as enjoyable. Bought this game this morning and absolutely love it! If you're unsure, do as i did: watch some gameplay on youtube. Really liking this game so far. The jumping bothered me at first (I like to be able to control the height of my jumps) but I got over it. Kinda gives it a Super Ghouls and Ghosts vibe. Hey, does anyone know how to add/write notes on the Castle Map? I totally skipped through the in game explanation by accident and I can't seem to figure it out on my own....And I can't find any instructions online anywhere that describe how to do so. Thanks in advance. Great game so far though, "Take some gold, he said, it'll be great he said.....death #1...."
Nicez. I would buy this game, but atm I'm playing the hell outta my Vita because of the 14 for 14 sale on PSN right now! If they made a D&D game for the WiiU and the person with the gamepad was the dungeon master and the people using the four wiimotes were the adventurers... oh man that would be awesome. I really don´t have much time to play and my list of "Games pending" is too large but this games looks great and I feel I need to give some love to the Indi developers for their work. Got it and initial impressions after an hour or so are that it's the best indie title on the eshop since Trine 2. Would recommend. Really enjoying this game. Very much worth the purchase. Unepic is a great addition to any Wii U library. Great price for what you get. Which is a lot. I am a dad of 3 - two boys 9 & 10 and my little girl 5 - we have a been huge Wii family since Mario Kart Wii - So of course I had a Wii U right after launch - WHILE WE LOVE MARIO & SONIC - and Scribblenauts & skylanders - Disney infinity & Lego CITY & The Lego movie game - UNEPIC is what has trapped me (daddy) into a wonderful world of Castlevania meets Dungeons & Dragons meets Eddie Murphy & General Akbar (spoiler) - THIS IS EPIC - THIS GAME IS AS AWESOME as it gets for D&D kids w a ense of humor. IM 75% through & I can't wait to reveal the plot points hidden within Zera & Myself - all my kids have their own game save - as I forbid them from using my potions & scrolls - lol - this game rocks - I'm shocked it's not on ps3/4 & x-box. For anyone on the fence / haven't picked this up yet .. On sale now for 4.99. Just picked it up ..looking forward to it !